Jasmine Tea Caffeine - Frequently Asked Questions? How much jasmine tea caffeine in a cup? What about drinking a decaffeinated? Advantages of drinking a high grade. Over the past decade, there has been much controversy surrounding caffeine. Some people say that it is bad for your nerves and heart, while studies have found that caffeine can be beneficial to health and reduce your risk of certain types of cancer. Both sides, actually. The Greek philosopher Aristotle had some good advice on the subject: "Seek moderation in all things." Heavy consumption of caffeine turns some people into nervous wrecks, but moderate consumption is actually beneficial for most of us. However, if you are sensitive to caffeine or just trying to moderate your intake, you may be concerned about the amount of caffeine in your favorite jasmine tea. What are the pitfalls of having decaffeinated jasmine tea? If you can tolerate a small amount of caffeine, what are the advantages of having a high quality jasmine tea made of tender tea buds? How Much Caffeine Does It Contain? Jasmine tea is actually green tea that has been scented with jasmine flowers. Like any other green tea, jasmine tea will contain caffeine. The same applies to jasmine pearl tea, which is scented green tea leaves that have been rolled into tight balls. The actual amount of caffeine a jasmine tea can contain will depends on the variety of tea it was made from, where it was grown, and how early it was picked. So it is impossible to say with precision the level of caffeine content. A useful rule of thumb is to assume that a cup of green tea contains roughly half the amount of caffeine found in a cup of coffee i.e. 50 milligrams per cup. You can try drinking decaffeinated jasmine tea, but much depends on the actual chemical process used to decaffeinate the tea. If you go down this route, beware that the decaffeinating process can make the tea taste light or even metallic. Ugh! To add insults to injury, decaffeinating process can remove up to two thirds of the antioxidants that make green tea so good for you. What's a jasmine tea drinker to do? If you can tolerate a small amount of caffeine, the best course of action is to choose a high-quality, loose-leaf jasmine tea. Tea bags has more caffeine than loose leaf tea - and it usually has fewer antioxidants! A high quality jasmine tea is made from tender tea buds harvested early spring. They can be infused at least three times. Caffeine dissolves readily in hot water, so the first infusion will remove much of the caffeine. The second and third infusions will contain little caffeine. With loose leaf tea, the same amount of leaves can make three cups of tea. Tea bags can only be infused once. Drinking three tea bags will obviously contain more caffeine. Or, you can pour out the first steep and avoid most of the caffeine altogether, although it can seem wasteful to pour such delicious tea down the drain! If you are drinking a good jasmine tea, you should not have to worry too much about jasmine tea caffeine for two reasons. First, Mother Nature has provided her own decaffeinating system for green tea - theanine. Theanine is an amino acid found naturally in tea leaves. It has a mild tranquilizing effect that counteracts the stimulant effect of caffeine. However, average-to-poor quality jasmine tea does not have enough theanine. To get enough theanine, you need to get the good stuff, yet another reason not to settle for grocery store tea bags! Second, the jasmine scent also helps in reducing the effects of caffeine. Jasmine contains a compound called (R)-(-)-linalool that works to reduce your heart rate and produce a calm state of mind. Much like theanine does! With the combined power of theanine and jasmine, there is even less to be concerned about with jasmine green tea than there is with regular green tea. In conclusion, the best way to minimize jasmine tea caffeine concerns is to get a quality jasmine tea! In China, the best jasmine scent is described as Xian Ling, which can be translated as fresh and nimble. You can feel the jasmine scent instantaneously without any repeated effort. The scent is highly durable lasting multiple infusions. After steeping, the tea liquor appears bright yellowish-green with luster. 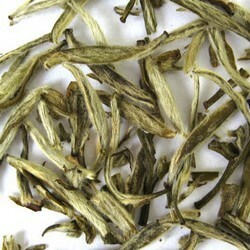 This Golden Needle Jasmine King Tea has all the above qualities and more. Launched in 2009, the tea has accumulated nearly 100 raving reviews. Customers are saying that this is the best jasmine tea they have ever had!